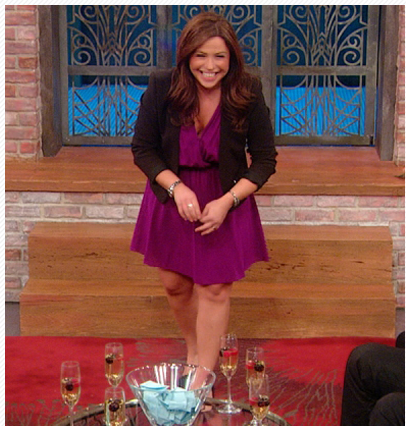 Compunetix Employee on the Rachael Ray Show! “The Rachael Ray show sends out a weekly email, letting everyone know what is on the upcoming shows for the week. At the bottom of the email, they have a ‘Be on the Show’ section. It features 3 show ideas that they are looking for people to interview and possibly be on the show. The one I saw back in July was ‘Do you have to food shop on a budget? Are you always following sales and clipping coupons? Do you try to eat in more than eat out?’ I clicked on the link and filled out the form. Initially I thought that it would just be cool to share my story because a lot of people I know honestly have no idea how to shop healthy on a low budget. Within a week, the segment producer contacted me. She asked questions about our budget and how I shop, etc. We talked a few times here and there over the next two months. During that time the show was deciding exactly how they wanted the segment to go. At the end of September the segment producer contacted me again and said Rachael Ray had decided she really wanted to do a food swap challenge. She wanted two families with completely different shopping habits and budgets to switch budgets for a week. We are the family that uses coupons, watches sales, and spends $60 per week on food. The other family buys the best of the best. Never looks for sales. Never uses coupons. On October 4 they called to tell me a camera crew and producer would be spending the entire next day with me and my family, including my husband Josh and children Skyler 22 months and Brennen, 9. On October 5 they filmed me shopping at Shop ‘N Save, Sam’s Club and a new prototype for Dollar General in West Mifflin. They also filmed me in my car and at home cooking dinner. We filmed for approximately 15 hours that day. At the end of that very long day, we received the letter letting us know that the other family spends $600/week on food! Also in the envelope was $600 in cash for us to go shopping with. The other family received our very hefty $60! The camera crew and producer came back on October 6 to film me spending some of the $600. They filmed me cooking at home again. That was about an eight hour day. For the rest of the week the show provided us with a camera to film ourselves spending the rest of the $600. We sent them 67 videos that week. The Scopo family didn’t handle the change well. They are also a family of 4, like us, and compared the food that week to dog food and were caught cheating and ordering Chinese food! The show flew us to New York, all expenses paid, for two days. We filmed in studio on Wednesday October 16th. At the end of the show Rachael gave both families a full set of cookware. We also received a surprise $8,000 gift card from Giant Eagle! The episode aired on October 30 nationwide. Congratulations to you and your family Dominique! For coupon cutting tips and tricks or healthy recipes on a budget, be sure to email Dom at dchandler@compunetix.com. For more information about the Rachael Ray show, visit http://www.rachaelrayshow.com/.